Fish tacos are one of my happy places. Most of my favorite food-related happy places involve either avocados or chocolate, but tacos? They totally make the list (and bonus: I usually sneak some avocado in there). I love them. 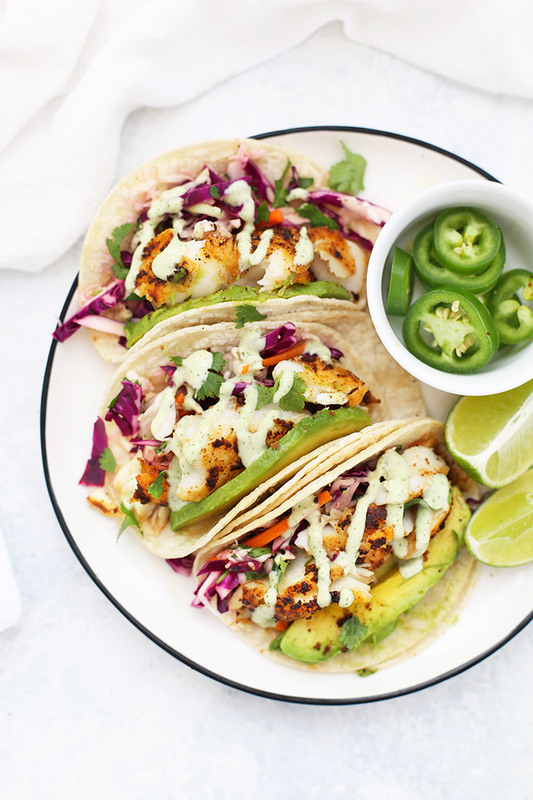 They’re quick and easy, packed with flavor, and also TACOS. First off: the spice rub. 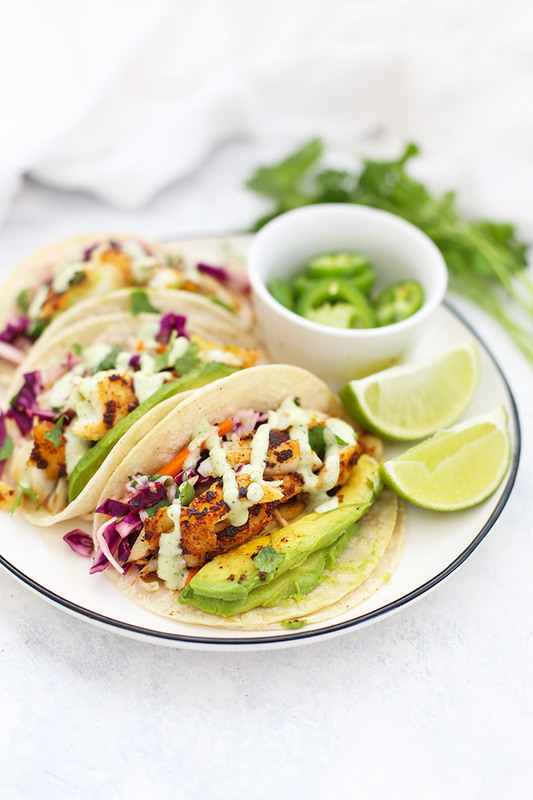 My fish tacos use a simple spice blend to add big time flavor without big time effort. I combine classics like cumin and chili powder (and a few other little things) and make sure that all the fish gets the spice-rub treatment. Then, it’s all about the goodies. I love fish tacos with slaw best. This one brings plenty of flavor with fresh lime, a tiny bit of honey, and cilantro. 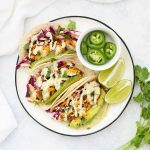 Then, I drizzle the fish tacos with a little something creamy to finish them off–either my favorite tomatillo-ranch or citrus avocado sauce does the job. 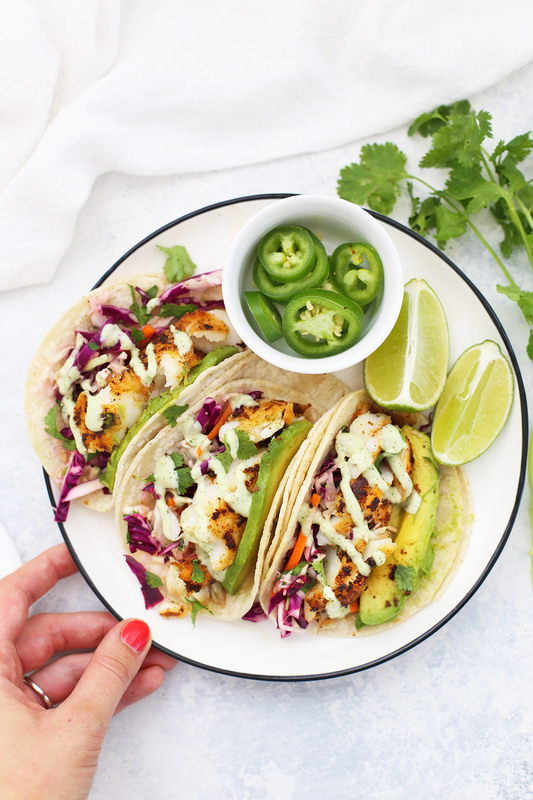 The combination of smoky spices, bright slaw, and creamy drizzle on top all wrapped in a warm corn tortilla is flavor and texture perfection. Can you see why tacos are one of my happy places? Let’s talk heat (the temperature one) – As I mentioned above, I like cooking these fairly quickly over a hotter pan. A cast iron pan is my go-to because of the way it retains heat so well. I can get a really nice sear on my fish over medium heat in my cast-iron pan. If you don’t have one, you can totally use whatever you have. Just be sure you have your heat set to at least medium or medium-high so you get a nice sear and cook the fish through without overcooking it. Drizzle and top your tacos! Exactly what you want to drizzle over your tacos is up to you. Since my slaw doesn’t have a creamy element, I add that with a little something drizzled on top. I love using my tomatillo ranch (my top pick! ), or citrus avocado sauce since they’re bright and fresh and a nice contrast to the heat. You could also swap in my chipotle ranch for some extra kick! Guess What Goes Great with Fish Tacos? In a small bowl, combine chili powder, cumin, garlic powder, onion powder, smoked paprika, and salt. Place fish in a shallow container (or zip-tip bag). Pat dry with a paper towel or clean kitchen towel (this will help your seasoning mix stick). Rub with all of your seasoning blend, coating generously. Heat avocado oil in a medium skillet over medium heat. Working in batches so as not to overcrowd the pan, cook fillets 3-4 minutes per side or until fish is opaque and cooked through. Repeat with remaining fish. Gently separate cooked fish into small sections for tacos. **Nutrition facts calculated assuming 1/4 of the fish and cabbage slaw per person, plus 3 street-taco sized corn tortillas. Does not include avocado or tomatillo ranch. What brand of corn tortillas do you use? I struggle to find one I like. 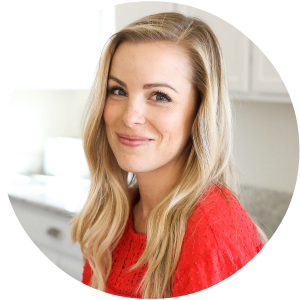 I like a few brands–Mission makes gluten free street taco-sized corn tortillas that are yummy (that’s what I used for the photos) or you can buy cook-your-own corn tortillas (look in a refrigerated section at places like Sprouts, Target, or Kroger). The biggest thing I’ve found with corn tortillas is that if I don’t warm them in a pan, they taste a bit “raw” to me. I always warm them in a warm pan to get a little color on them. (or you can wrap them in a damp paper towel and microwave them for a few seconds). Heating them will take out the “raw” flavor. (If you have a gas burner, you can even turn the heat to medium-low and use a pair of metal tongs to color them right over the flame!) I hope that helps! These were FANTASTIC!!! Wow, so much flavor!! The combo of slaw, fish, and sauce was just perfect. We LOVE THEM around here–they ALWAYS get gobbled up fast! I’m so glad you liked them! These were absolutely delicious. I loved the bright citrus flavor of the coleslaw and the spice level on the fish was perfect. I will definitely make these again. YAY! I love hearing that. They’re my favorite! So glad you enjoyed them too. Thank you so much for sharing! I made these with shrimp and used the citrus avocado sauce. They came out amazing and my family loved them. What a great recipe. Oh YUM! What a delicious combination! I’m totally trying that! 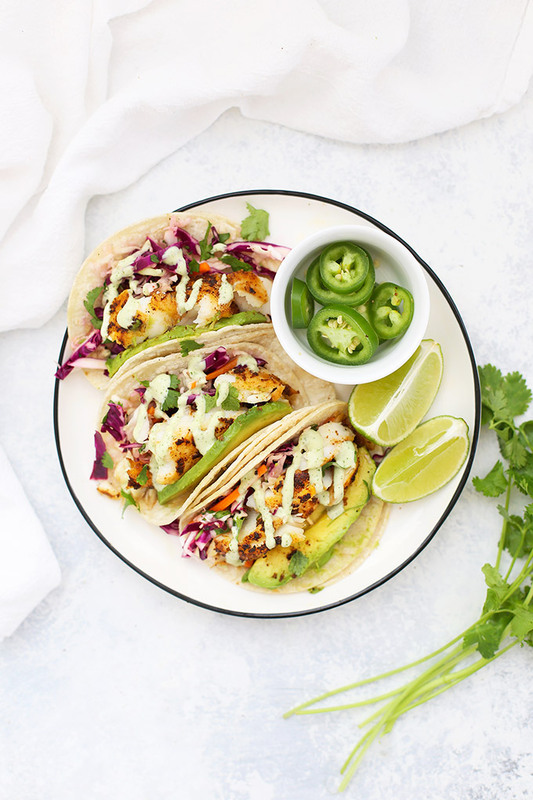 I have to tell you we were struggling to find a baked not fried fish recipe for our fish tacos and this is perfect. All ingredients we have on hand regularly. This is such a keeper. We cheated on the sauce and used some chipotle mayo mixed into lowfat sour cream but made everything else as described. And loved finding a staple beyond sandwiches and avocado toast for using up ripe avocado laying around. Oh, I LOVE hearing that. Thank you so much for sharing this! They are FANTASTIC! We have an local upscale restaurant that has fish tacos but these were better! Thank you! Oh my goodness! What a compliment–thank you so much!